Astoria, will thy wonders never cease? The other night, a brief respite from the stinging cold occurred and I stumbled out of HQ into the looming dusk. My ideation involved no destination, rather it was just a desire to give my internally lubricated parts a chance to operate. There’s so much sitting and hiding from the cold this time of year that a man of my age finds himself stiffening up without a regular scuttle. During warmer climes, I’m out and about all the time, but this is the time of year for which I build a pile of books to consume and address long standing projects. That means that when I do start moving around again, it hurts, and there’s sounds traveling along my skeleton which I do not like. Stretching my leg the other day created a resonance that sounded like hitting the strings of a Cello with a sack of oysters. You’re about to see the big project I’ve been consumed by for the last few months at the start of Februrary, incidentally, which is what a lot of this sitting in front of my desk has revolved around. It’s the start of a whole chain of “stuff” which I’ve been working on, which will be revealed over the coming months. 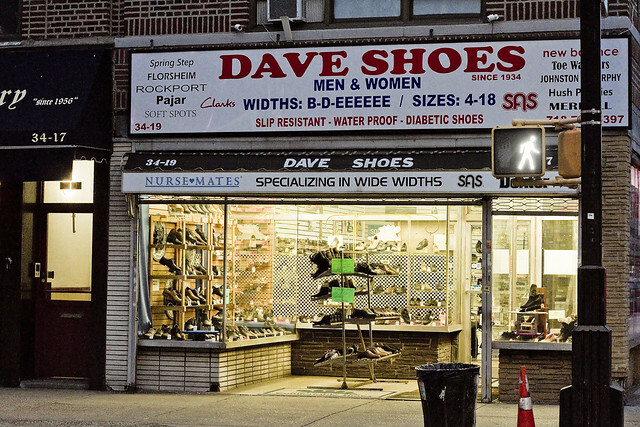 My path carried me down Astoria’s Broadway, and at the corner of 35th street, my eye was caught by the signage of Dave Shoes. I’m sure I’ve mentioned this subject in the past, but I’m fascinated by the offerings of this small business. A bit of quick research revealed that a man’s foot requiring a “size 18” shoe can be expected to display a heel to “big” toe length of thirteen and five sixteenth inches, and that a six “E” shoe width translates out to a foot of some six and one eighth inches across. That’s a pretty big foot. 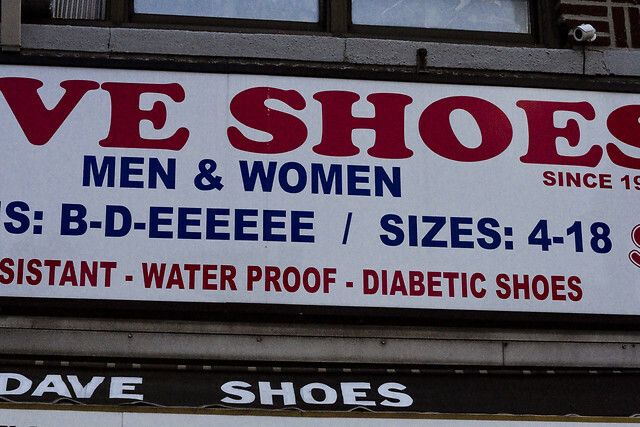 Apparently the average American male can be expected to wear a “size ten” and “d” or “m” width shoe. I’ve experienced a certain foible of human biology which younger readers probably haven’t, as of yet. That’s the tendency of the human foot to spread out and its arch to become more shallow as you grow older. In High School and early college, already fully grown, I wore a size nine and one half shoe. By the time I was thirty, a size ten was required. These days, an eleven is what I buy at the shoe shops. Presuming I somehow make it through another twenty years, my shoes will likely look like swimmer’s fins with my toes extending several feet out in front of me, and it’s likely I won’t be scuttling but instead flopping along the bulkheads like a seal by then. I’ll probably be a much better swimmer, so there’s a silver lining. Saying all that, barring some cartoonish interaction with a steam roller, I doubt I’ll ever be shopping for a size 18 6E shoe. A humble narrator will likely need to forgo the usage of escalators in this dire future. Modernity is so boring. 31st street? Really? Can’t we just go back to Debovoise Avenue, which is what 31st used to be called in Astoria’s 19th century? 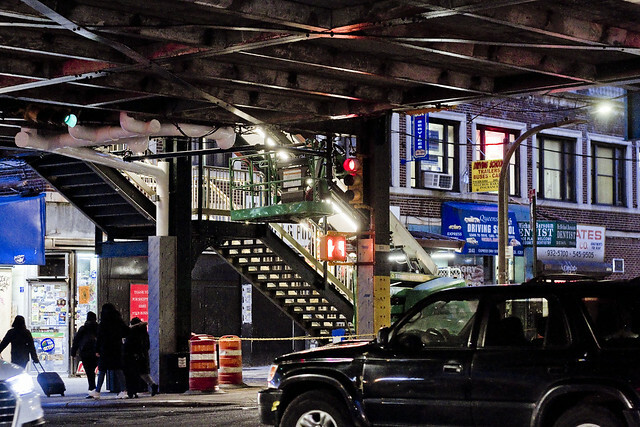 I’ll admit that the old system, when 31st avenue was Jamaica Avenue and 30th was Grand Avenue, was a bit confusing to outsiders but at least Astoria was safer in case of an invasion. The north/south streets and east/west avenues and using numbers instead of names are some times called the Philadelphia plan. The “Commissioners Plan” rules the roost in Manhattan, where the streets are east/west and the avenues north/west, as a note. Post NYC Consolidation, the new powers that be in City Hall created the modern day street grid of Queens by renaming all of the hodge podge street names offered by all the independent towns, cities, and villages that predict dated 1898. That’s why you’ll encounter those corners where time and space bend in on themselves like 31st avenue at 31st street.